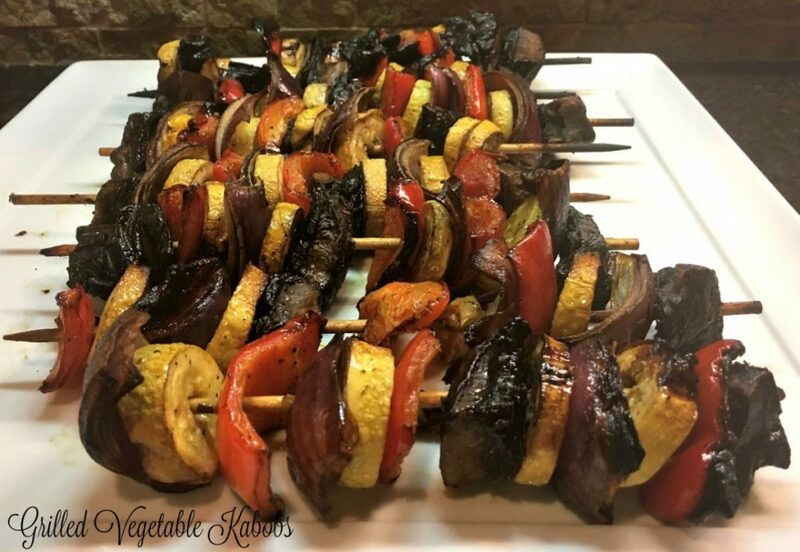 These healthy and delicious grilled vegetable kabobs get huge flavor from a sweet & tangy balsamic marinade and a short stint on the grill. They are outstanding! With most grocery stores carrying fresh vegetable skewers, it is super easy and convenient to make these grilled vegetable kabobs in no time flat. Buying vegetable skewers not only saves time from washing, chopping or dicing, but it can save money. You are buying just what you need for that night’s dinner~no leftovers or waste. A note on balsamic vinegar: I am not a snob on many condiments, but balsamic vinegar has to be good, or you can ruin a perfectly good recipe. Why? Because bad balsamic can be overly astringent and overpower a good vinaigrette or marinade. The photo at left is of two balsamics that I keep on hand. Both are Lucini, but the one on the left is more expensive and far higher quality. 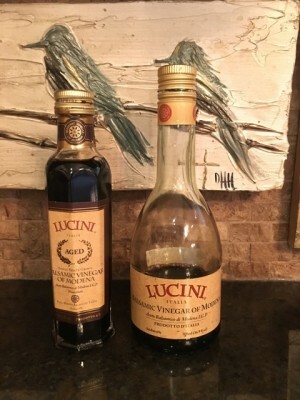 I use it for soups, marinades, and anything that will allow the balsamic flavor to shine. The one on the right is an all-purpose balsamic that I use in soups or hot dishes. Heat mutes the ability of balsamic to overpower a dish, so less expensive is fine in these dishes. The recipe that I follow for these grilled vegetable kabobs is slightly adapted from the “Char-grilled Vegetables” recipe on page 74 in The Junior League of Birmingham’s Food For Thought.. I LOVE this cookbook and highly recommend it for those who love good cookbooks and unique Southern recipes. This cookbook was published in 2007 but can still be purchased. If you buy it, be sure to try three of my faves~Ham and Swiss Tart (pg 54), Hattie’s Cheese Biscuits (pg 69), and Gorgonzola Potatoes (pg 168). The recipe below is what I use when I make my own vegetable skewers, but you can adapt it to store bought skewers or switch up the vegetables to make your favorite kabobs. So, here is the recipe for one version of these yummy, healthy, vegetables. If you have any leftovers, they are wonderful the next day served on crusty French rolls. If you make these, I’d love to hear how you like them! As always, thanks so much for stopping by. Be blessed, and stay savvy!!! Combine vinegar and next 4 ingredients; whisk until well combined. Pour over vegetables; marinade in fridge until time to grill. Grill over low to medium heat until charred and crisp-tender.